We get a lot of questions about what we do and how we do it, mostly from other organizations and individuals working in Haiti. As our project continues to grow we receive more and more questions like yours, so rather than quickly responding to many emails we wanted to to let this be a resource for you to see if we can answer your question in depth. What does Clean Water for Haiti do? We have two major components to our work – a bio-sand filter distribution project and a training center. The filter distribution is managed by sales. We sell the filters for a highly subsidized price, and distribute them according to who is willing to make the investment. To learn more about our filter program visit our Filter Project page. The training center is for teaching members and workers of other organizations how to start their own bio-sand filter projects. To learn more about our training classes please visit our Training School page. Great question! Each filter costs us about $100 US. We build all our filters in Haiti at our facilities using local labor and materials, and deliver and install them with our own vehicles and staff, so that cost includes all raw materials, labor, fuel, and utilities. It also includes the cost of 3 follow up visits to the household in the first year of use and any repairs needed. You said your program was subsidized. What does that mean? Our goal as an organization is to give all families in Haiti access to clean water in their homes. The problem is that most families would never be able to afford the $100 that it costs us to produce, deliver, install, and follow up on a filter. But, we don’t think just giving filters away is the answer either. Our experience has shown us that families who invest some of their personal income into a filter are the ones that will use it and look after it. Our goal is to have each family using their filter for the long term. By requiring that every family who wants a filter pay a small co-pay of 200 Gourdes, the equivalent of about $5 US, the filter becomes something of value. We know this system works because we keep data on every filter installed, and our records show that with this model and our follow-up program working together, over 95% of our filters are still in use after the first year. Can we buy filters from you and install them ourselves? Sorry, but no. No offence intended, but a bio-sand filter is a piece of technology that people are relying on to improve their health. It requires training and understanding to know how to properly install a filter and to provide the correct user education to the family receiving it. When we install a filter in a home we’re asking families to have confidence in the fact that it will work and remove disease causing pathogens. If a filter isn’t installed correctly it can very literally cause death because people will be trusting it to work when it doesn’t. Our staff are trained extensively, and through our follow-up program we’re able to target any issues that the family may have with understanding how to use their filter, as well as provide any sanitation and hygiene education that will be helpful for stopping the spread of water borne disease. We also have to consider the reputation of the bio-sand filter. A poorly installed filter can negatively effect the reputation of bio-sand filters in Haiti, making them something people don’t want to adopt rather than something that is seen as an affordable and effective household water treatment method. Clean Water for Haiti has one of the most effective bio-sand filter projects globally, so we hope you can trust our experience in this area. Can we buy filters from you and have you install them in homes in a community/zone of our choosing? Not normally. In very rare cases we might work with an organization if it’s practical to make it work. We insist upon the households still paying the subsidized price without exception, and the organization will have to pay a bit over the $100 cost per filter to help cover some of our overhead. In cases where a larger number of filters are wanted we’ll encourage you to start your own filter project and work with you to guide you along the way. Will you sell us a filter to put in our orphanage/school/clinic/mission? Maybe. We really want to see everyone getting the water that they need. One missionary told us that his bio-sand filter had saved him over $1000 US in water costs over the years because he was able to treat the water he had rather than buying treated water. However, it’s logistically difficult to get one or two or three filters to a certain place and install them, so we’ll need your help. Your organization will be responsible for transporting the filters and our technicians to your site, and providing accommodation if your location requires an overnight stay for our staff. Because of the logistics in situations like these, both for installation and follow up on the filters, we have to charge organizations the full $100 US for their filters in order to completely cover our costs. If you are abroad please have someone in country that works with your organization contact Chris Rolling by phone (3718-8019) to learn more of what’s involved and to make arrangements. What can you do to help us start our own filter project? This is one of our favorite questions! We want to see bio-sand filters all over Haiti, but there’s no way we can do it all ourselves. That’s why we established our training school, and why we host classes throughout the year even though it’s a lot of work! We have a great page that explains our training classes in depth, so please go to the Training School page to read all about them. What's involved in starting a successful filter project? It’s hard to start a filter project, and it’s even harder to start a filter project in Haiti. Even harder still is starting and running a successful filter project in Haiti. 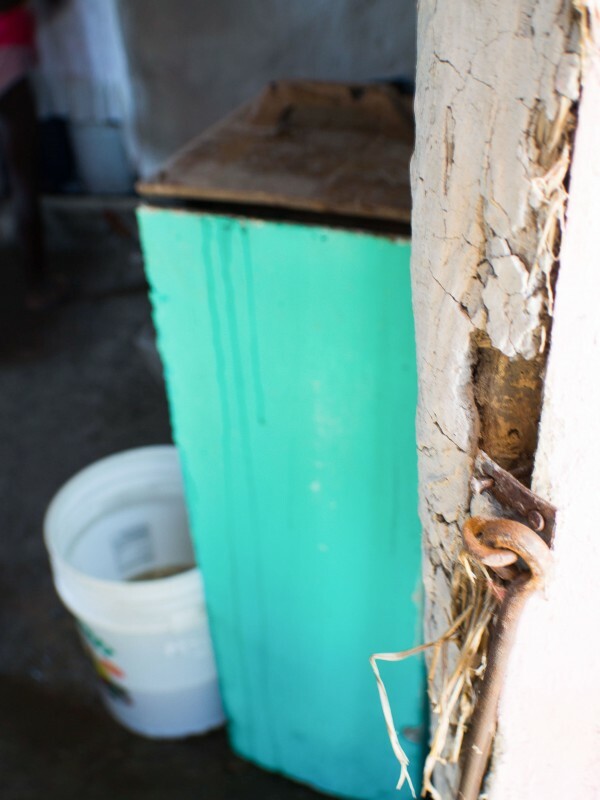 Clean Water for Haiti focuses on bio-sand filters and nothing else, but even after all these years we still encounter difficulties and we hope you can learn from our challenges. At the most basic level you will need to have funding in place for the project, a location to build your filters, a supply of materials and tools, and trained staff. We can provide training through our Technician Training classes, and in that process will provide your students with many tools that will help them start your project well. What kind of funding is needed to start and maintain a simple filter project? Most of the organizations we train want to start small, which is a great idea. But, with the investment and training to get everything set up we encourage organizations to plan on building at least 100 filters. Organizations that have done it well find that running a bio-sand filter project is one of the best investments their organization can make in their local community and many choose to expand their program. At the beginning it’s safe to plan on each filter costing about $100 US. This would include all of the materials, labor, delivery, installation and follow up costs. Please know that depending on where your project is located these costs will vary because of availability of materials, transportation, etc. This is just a guide. You will need to have a location to build the filters and lock up supplies and tools. Consider how you will transport your filters and materials and the costs involved in that, whether it’s maintaining a vehicle that you already have, or finding a way to rent public transportation. And then there’s your staff. We typically recommend that a project with a goal of installing 20 filters per month at the start initially train 2-3 technicians and plan for their salaries. We cover all of this during the training sessions and will be happy to speak with you more in depth as we help you prepare to get started. What type of people should I be looking for when it comes to staffing my project? Another great question, and frankly it’s one that will greatly determine the success of your project. In our experience, both with our own project and with the organizations that we’ve seen who have done a great job running their projects, we’ve found that having the right Project Manager makes all the difference. This person should have enough education to be able to handle the finances and accountability of the project well. There is some administration that will need to be done as far as keeping track of filters that need follow up visits. They need to be someone that doesn’t have another job that will take them away from running the project. While we know that a lot of people think having someone in this role that already has responsibilities within your organization will work, it typically doesn’t. Running a good filter project is a full time job. You also need a Project Manager that is able to lead your other staff well. As for your Filter Technicians, you want to look for people that are able to understand the way the filter functions, how it removes microbes and treats water, and who can explain this process to the families that will be receiving the filter. They will need to be comfortable giving directions and instructions to the families when they install the filters, and will need to be able to read and write in order to help you keep accurate records of the filters you’ve installed. Filter Technicians are also responsible for all of the construction of the filter, which is a lot of hard work. You definitely want your Project Manager to come, as well as any Filter Technicians that you need trained. On occasion we have organizations send other people that may do things like the administration aspect of running the project simply so they understand the whole process. We also strongly encourage you or someone in a key role from your organization to attend the training with your team. It helps improve communication within your project because you’ll know all the details of what’s involved, the financial aspect of things, how we teach your students to build filters, what’s really needed to get started and how you can grow over time. We also love to encourage organizations to involve women in their project. While the work of constructing and installing filters is labor intensive, we’ve found women make some of the best Project Managers and educators. What tangible items will we need for our project? First you’ll need a place to work from. Whether you rent a small piece of land or you already have space, there are some key things you want in place. First, a small depot where you can lock up tools and materials like cement. You will need some source of water on site, whether you truck it in to a reservoir or you have a well on site. You don’t need to have electricity, but if you do there are things you can do to simplify your work. When we teach our training classes we teach students how to do things without electricity, but they also have the opportunity to see how we run our operations with full time power and the changes we’ve been able to make in our process because of it. You will need some form of transportation for delivering your filters, whether it’s a truck you already have available, a wheel barrow, a donkey, or a tap tap you rent. There are a lot of options that we’ll discuss with your students when we do their training. There is a list of tools that your students will be given during the training class as well, and we’ll discuss where we find specific things to help with sourcing. Should we run a subsidized program like Clean Water for Haiti? In our honest opinion? Yes. Why? Well, when we first started we tried just giving the filters away to households and communities and in almost every case the filter was abandoned only months after it was installed. The reason? No one had invested anything into the filter so it wasn’t important that they use it or look after it. We eventually went to a subsidization model where Clean Water for Haiti covers most of the cost of the filter, and each family pays a small co-pay of 200 Gourdes (about $5 US). It’s a small enough amount that even the poorest families are able to pay it, but it’s enough that the filter becomes something of value. We know this system works for two reasons. The first is that we keep data on each filter installed, and over 95% of our filters are still being used after the first year. That’s a big thing for us. The second reason is that Haitians tell us that they should be paying for their filters. And frankly, there’s nothing better than seeing how excited a family is when delivery day comes and they see their filter being installed and running water for the first time. They’re excited because they know it’s something they’ve done for themselves. True development happens when people are involved in the solution. Are all the materials needed to build bio-sand filters available in Haiti or do you have to import them? The reason we’ve chosen the concrete version of the bio-sand filter is because we can get everything here in Haiti to manufacture them, which means no hold ups or delays in producing, delivering, and installing our filters. The filter box itself is made from concrete (sand, gravel & cement). The filter needs sand and gravel for installation. Sand, gravel and cement will be things each project will need to source locally. We work with local tradesmen to have all of our filter lids produced locally, and will explain this process during the training. Other components like the tube that runs in the front face of the filter and diffuser basins needed for installation are the hard parts to find and can be expensive. As a service to other projects we buy or have these items produced in large quantities and ship them in, then sell them at cost to organizations who have gone through our training. We also build the steel filter molds on site, thoroughly test them for you, and sell them at cost. We want you to succeed and this is one way we can help that happen. We will cover this in the training and information we provide as we help you get your project started. If you haven’t already, please visit our Training School page to see if your question has been answered there. If not, please contact Chris Rolling by email at info@cleanwaterforhaiti.org or phone at 011+509-3718-8019. He’ll be happy to work with you as you navigate everything involved in starting a filter project in Haiti. Why did you choose the bio-sand filter out of all the options available? We’re a development organization, so our goal is to help people live better lives over the long term. The bio-sand filter is one of the most practical filters for Haiti. In the household water treatment world it’s what we like to call “appropriate technology”. That means that it takes into consideration Haiti’s challenges, the low level of infrastructure, cultural practices and what resources are available to the average family. The bio-sand filter has a high flow rate, which means it can meet all the water needs for a family on a day to day basis. There are no replacement parts needed for it to function. It can filter even the most turbid water, which is a big thing as many of the families we work with are reliant on canal water to meet their needs. It doesn’t need electricity to work, and it’s simple enough to use that even the youngest members in a home can use it. Most of all, the concrete model that we use is durable. We have filters at our facilities that have been in use since 2001, so we know concrete bio-sand filters can serve the people of Haiti for the long term. What kinds of source water can be used in the bio-sand filter? Almost any kind! This is one of the things that we love most about the bio-sand filter. Most people in Haiti get their water from a stand pipe, well, canal or hand pump. The bio-sand filter has the ability to handle high levels of turbidity – that silty mud that gives source water a muddy look. It’s always exciting to install filters in areas where people only have brown canal water available because they get really excited when the first buckets come out clear. While we know that the filter is taking out disease causing microbes, they’re seeing clear water for maybe the first time ever. The bio-sand filter can’t remove salt, so sea water can’t be used, and it doesn’t remove chemicals, but chemical contamination isn’t a problem in Haiti. Why don't you build community filtration systems? At it’s start Clean Water for Haiti attempted to work in a community capacity, which involved installing bio-sand filters in key locations where anyone in the community could access them. The problem was that no one was responsible for making sure the filters were being used properly. In every case the filters fell into disrepair and were abused. We don’t think that’s a good use of donor funding or an effective way of helping people get clean water, so we decided to focus on a household model. Every filter we install now has to be installed in the home. This gives the family full control over their filter. It means they know that it’s being taken care of and used the way our technicians have taught them. They don’t have to worry that someone has tampered with it, which can directly affect their health. From an education perspective it means our technicians can work directly with the users during follow up visits to ensure that they fully understand how to use the filter, and can provide extra education to help the family put preventative sanitation and hygiene practices in place. Why don't you drill wells? When Clean Water for Haiti started we did drill wells, but we chose to shut down that program for several reasons. First, we know that if we divide our attention the filter program would suffer, and we decided we would rather do one thing really well than a few things a little well. Drilling community wells requires a certain degree of community involvement, and it can be very challenging to work in a community capacity here. It can also be incredibly difficult to find people within the community who will take care of the well once it’s drilled. A non-functioning community well isn’t helping anyone. Lastly, after several years of working in Haiti we recognized that everyone has access to water here. Yes, some people may have to go a long way to get water, but they’re finding water. The problem is that the water they have access to is contaminated. We would rather focus on improving their health with what they do have access to right now. We can do that by running a really good filter program. Do you have plans to expand your operations? Yes! Now that we’re at our new facilities our goal is to be installing 400 filters each month. But, we believe in doing things in a sustainable way. For us that means setting a production goal that finds a balance between the funding we have available and what we can do well. If either part of that is taking priority our program isn’t effective. We can produce a lot of filters in a year and install them, but if we can’t provide effective follow up and education people won’t be getting the water treatment they need. If we do a lot of promotion and filter sales, but don’t have the funding to support the demand then people get frustrated and don’t see us as a reliable organization. To grow well we need to increase our staff and train them well. We need to know the funds are coming in so we can be doing the promotion and purchasing materials to produce the filters. And we need to have the means to follow up on the filters we do install, which means more labor in place. We would love it if you’d help us work toward this goal!